okay, so i have my bike assembled and ready to go, i think. i have avid elixir CR brakes, and see that it appears that i can adjust not only the pad contact point, but the lever reach as well, is that correct? my question is that it seems like the point where the pads actually start to "bite" is somewhat close to the bar, which maybe is normal for MTB... i'm just used to motorcycles where the pads are engaging almost as soon as i'm touching the lever...so i'm wondering how i adjust this? i have tried rotating the red aluminum part both ways, but it seems to be as far in as it will go (quicker contact). the black dial, however, is somewhat of a mystery to me... am i supposed to remove the small set screw and then rotate it? i tried this, and it seemed to have no affect at all.. but with the screw in, it doesn't seem to rotate. what am i doing wrong here? 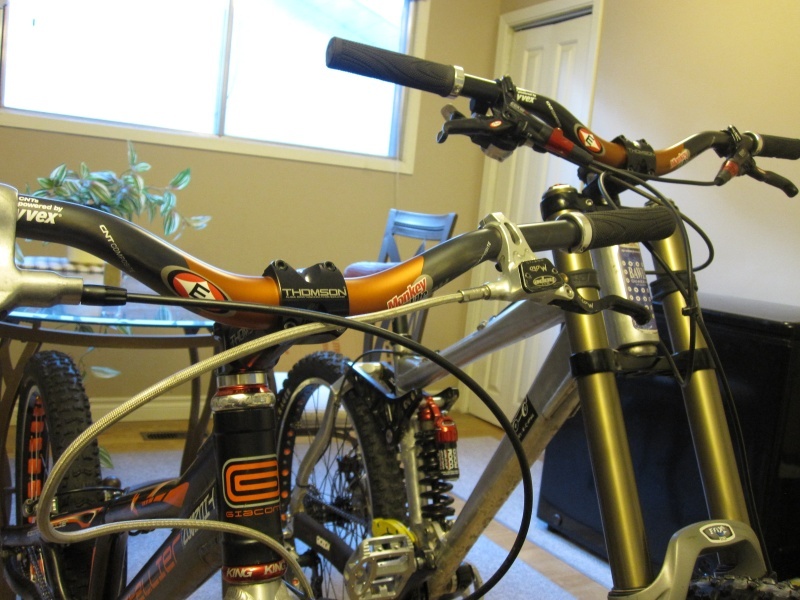 or, do i just have to adjust to the pads not engaging until the levers are almost at the bars?? I don't know but I have the same problem. Fresh pads and the bite-point adjuster all the way "in" and I still don't get any power until the lever is parallel with the bars. The red "contact point" adjuster allows extra lever movement before the movement of the lever starts pumping fluid. I can't for the life of me understand why anyone would want extra lever travel before the pads start to move. It's a gimmick. Turn it all the way opposite the arrow. The black knurled nut adjusts the "reach" or the "starting point" of your lever. The further the lever is from the bars when is at rest, then the further it will be from your knuckles when the lever is squeezed. I like to set mine as close as I can, but not so close that the lever will hit my knuckles when squeezing hard. There's always the possibility that you have some air in the system, which requires more pull on the lever before getting adequate bite on the pads. Out of interest, with your bite-point adjuster turned all the way in the opposite direction to the arrow, how far do you have to pull the lever before you start getting some braking effect (ie. not just the pads rubbing the disc but some actual slowing down)? To turn the black reach adjustment knob you need to pull it. It is spring loaded with grooves on the back to hold it in place. Grab the knob and you will see that you can move it a few millimeters and it will turn. See the red spring on the left? You need to push the reach adjust knob back against that while you turn it. Thanks for that. Much the same as mine then so I guess that's just how they are. Turning pad contact in.. towards the arrow direction.. makes the lever travel closer to the bar.. as if to say, the lever travels in more, and opposite the arrow makes the bite point out more. The point of it is to adjust where you want the pads to bite. I like my levers to pull parallel to the bar before they bite. i'm probably going to turn both of them all the way out... coming from riding sportsbikes i like to basically be able to rest one finger on the lever and have nearly instant response and bite. of course, this will more than likely end up with me throwing myself over my handle bars being the noob that i am. 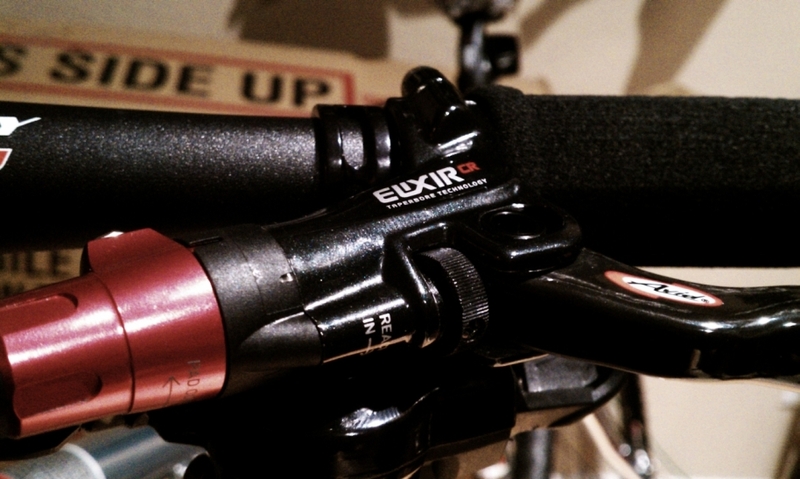 I called SRAM today because I am having the same issues with my Elixir brakes. They want you to use a "pad spreader" and first squeeze the lever until the pads are about 1mm away from each other and then spread them apart with the pad spreader. Do this or 6 times and you are supposed to be good. She said that they have had numerous issues with their brakes and for me to do this and if not the brakes should be bled by a certified dealer. (Obviously a new set of expensive brakes should not need to be bled....) I just got on my bike and rode it on the trails tonight and it improved a little bit, but not the way it should feel if you ask me. Still a bit mushy and I have the reach adjuster all the way out. i may have to try that since the adjustments both set to max out are not sufficient, for my rear brake at least. i don't get any engagement or bite until the lever is just about at the bar, which is not acceptable to me (especially on a new bike i would think). i ride with one finger on the lever, which means i can't even engage the brake like that, as the lever mashes my fingers before it even starts to engage. Last edited by McKraut; 11-22-2010 at 06:42 AM. any ideas? at this point do i just have to get the brakes bled? i was hoping this wasn't the case, since the bike is brand new, but if that's what has to be done then that's what i'll have to do. Sounds like your bite adjustment is turned the wrong way. Move your brake levers in, away from the grips if you're mashing your fingers. yup... bite adjustment is all the way adjusted out (away from the bar) and lever is adjusted to the full out position also... but it still doesn't event begin to engage until it's maybe 1 inch from the bar. I am having the same problem with my new CRs. I have CRs on my other bike and they work fine. This works. Actually it's too firm now, lol. Need to pry them back in a little more. Thanks though. Interesting seems like this step was used on the Juicy's bleed instructions by using the pad spacer, which are a lot thinner than the ones that come with our elixirs which is a huge block. I too was wondering why the lever pull catches right when it is parallel with the handlebars as well with all the dials turned out on my CR's. Maybe I need to get a spacer from a Shimano kit or Juicy kit and stick that between pads and pump the brakes then put the wheels back on. Then maybe I can utilize the dials to then turn in to fine tune. I had the same problem and this worked for me. I also then re-bled the bakes and got rid of any air that came from the factory bleed. Awesome brakes now! If you look at the block that came with the elixir bleed kit, one side is labeled "bleed block", the other is "pad spacer". Squeeze the brakes with the pads in, but the rotor out, then push the pad spacer in from the top of the caliper (same way the pads themselves go in). Pull it back out and it should then be spaced perfectly for the rotor. Ok, I see what your referring to on the block, but have a few questions. Do I squeeze the pads in to where they are almost touching each other? Next do I push the pad spacer in all the way or just barely to clear for the rotor to slide in? Excellent! I just did this and it improved my pad contact / lever distance! Parkp81, when squeezing the lever, keep an eye on the pads. Let them get close enough to still be able to fit the pad spacer in between them. The first one I did went in a little too far and I had to spread them out with a flathead screwdriver for the spacer to fit. When you push the spacer in, you will have to apply significant pressure to insert it. I pushed the spacer all the way in. Now my pad contact, while not instantaneous, is a LOT better (my rotors are >6 months old). Last edited by MootsRider; 11-29-2010 at 08:20 AM. Push the spacer all the way in, until the retainer screw goes into the notch of the pad. Pad adjuster turned all the way in towards the MC (opposite the arrow) and still have too much lever travel. Interestingly, they came new this way, exactly the opposite of the way they should be to account for pad wear. So what I am reading here is take the wheel out and pump the brakes to the point the pads contact one another then spread them back apart and reinsert the wheel and viola? Really?? Is the brake bleed kit needed for the spacer and block or can I do the same with a carefully used blade driver. What is the thickness of the spacer? I have the elixir r and the adjustment is better after following the procedure. BUT....as I adjust the lever so that it is closer to the handlebar, the distance the lever has to travel until pad contact increases - thus working against the improved adjustment. I figure there is not fix to this except get the next model up that has pad contact adjustment. Last edited by GavinXX; 01-08-2011 at 09:33 PM.